Mitchell's Potawatomi Journal: Diggin up pictures! This the last picture we took as three brothers. Larry, on the far right, died later that year in 2007. 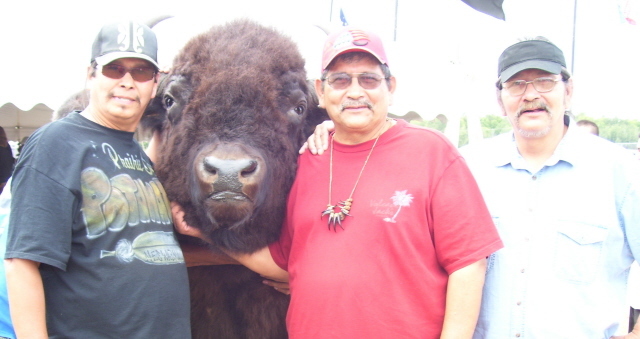 We were at a Potawatomi Gathering and for the hell of it, we took this picture by the buffalo head. It was crazy because a slug of people took our picture too for some reason. I wanted to share this picture so I won't forget either. We really had a good time that summer day! 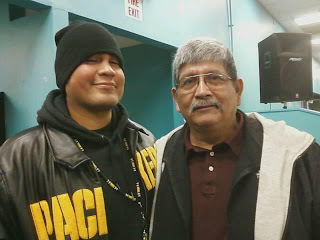 This is my nephew, Steven Mitchell, he dropped by from some tiny place near Phoenix, AZ. Steven wanted to visit his Potawatomi relatives for a few days. I'm glad I was at the Craft Sale when he pulled in. His journey was well over 20 hours on the train. My grandson Pat ko shuk wanted to know about him. I told him he is the son of my brother Bubs and he would be closer to an Uncle to him than a cousin, in our way. I missed seeing him grow up, along with other nephews and nieces and I'm so glad to see them when they do come here to visit. It's hard for an old cold hearted guy like me to develop tears but I did today when my nephew hugged me, but don't tell anybody. I have a B.A. in Political Science from Washburn University and masters in history and like to write on occasion. This blog will bounce off many topics so there not in any particular order!I’m not a real writer. I’m like Jimmy Buffet - I just tell the story and let somebody else make sense of it. I can be reached at my home email of shawnosh@yahoo.com Oh, I'm a member of the Prairie Band of Potawatomi Indians. We are located 20 miles north of Topeka, Kansas and about 80 miles west of Kansas City.